More information about the Transportation Tri-Folio Frame 2013 Wall Calendar. "Transportation Tri-Folio Frame Wall Calendar: This innovative calendar is new for 2013 and available only at calendars.com or in our Go! Calendars retail stores. 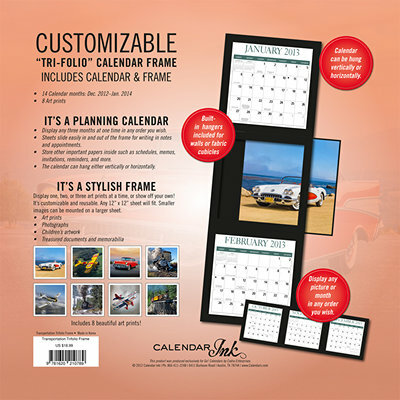 This tri-folio calendar includes three separate frames and can be hung vertically or horizontally. Display any picture or calendar month in any order you wish! Includes a durable three frame system with built-in plastic protectors, 14 calendar months (December 2012 -- January 2014), and 8 art prints. Use as a planning calendar to display any 3 calendar months in any order you wish, or display your own charts, schedules, etc. --- any 12"" x 12"" sheet will fit --- and you can use dry-erase markers on the plastic covering. And it's reusable! Display one, two, or three art prints at a time or show off your own. Great for displaying photographs, children's artwork, or treasured documents and memorabilia. Built-in hangers are included for mounting on walls or cubicles. Frame color is black. This creative, versatile, and"